The November window is open for women as well as men in the North. Altogether 15 women's Tests will be played in that time. All but two of the matches will be refereed by women. 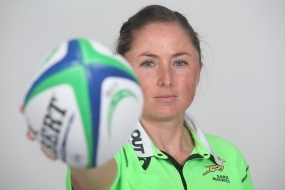 Of the referees, two are from the Southern Hemisphere - Aimee-Barrett-Theron, who blows the whistle to start the November Tests, and Rebecca Mahoney of New Zealand. Both referees played for their countries before becoming referees. Joy Neville played for and captained Ireland.